My name is Fumitoshi UKAI. Fumitoshi is given name and UKAI is family name. I was born in Kouka, Shiga, Japan and live in Minato-ku, Tokyo now. I'm a member of Debian Project. I maintain several debian packages, including mgp, w3m, hotplug, auto-apt, ca-certificates and mirror of debian in Japan, such as http://www.jp.debian.org/ and ftp://ftp.jp.debian.org/. I maintain http://snapshot.debian.net/ at home since 2002/06/04. I was Application Manager of New Maintainer Team. I initiated Debian JP Project in 1996 with some of debian members, such as yochi@debian.org, kamop@debian.org and so on, I was leader of Debian JP Project (1999-2002), sub leader of Debian JP Project (2003). Debian JP Project is a volunteer group to make Debian better for Japanese. At first, we released jp version of debian, but we're putting our efforts into debian now. We wouldn't release jp version anymore since we concentrate debian distribution itself, not separeted distribution. Now, we believe debian is ready to use Japanese. We haven't updated any debian-jp packages for years. We'll continue to work in debian to make good support for Japanese. I was an editor of http://www.debian.or.jp/diary/. I'm one of promoters of Japan Linux Association, aka JLA, established on April 1999. I was a Vice President of JLA and director of system administration division in first period (1999/4-2001/5). I was a President in 2001/6-2005/5. I'm a director of Free Software Initiative of Japan, Non-Profit organization for free software in Japan, established on July 2002. I'm a Vice President of FSIJ now (2003/6-). The objective of FSIJ is to contribute to Japan's economy and culture by stimulating and supporting the creativity of individuals. FSIJ will support developers and users of free software, advocate the principle of free software, organize international symposium, and facilitate the release of high quality free software from Japan to the rest of the world. FSIJ holds several events for hackers, such as CodeFest that programmers get together in a place and hacking over night. 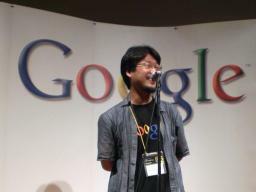 FSIJ also supports Google Summer of Code to help students joining Free Software community. I was a Project Manager in Exploratory Software Project 2003 and 2004. Exploratory Software Project is one of e-Japan project by IPA (Information Technology Promotion Agency, Japan) to support software genuis in Japan. e-mail: ukai@debian.or.jp for private, free software activities.